Darigan took a tighter grip on his sword, even though he knew it would do no good against beings such as these. “And here I was under the impression that I already had.” Darigan tried to keep his tone light, but a steely edge of anger had crept into it. Anger mingled with fear. While he was out from under the thumb of these creatures and he knew it, they had not lost their unnatural power to intimidate. Darigan wrenched himself free, and the swirling lava of Revenge’s gaze was replaced by the blank wall of the corridor to which he had turned his eyes. But the tendrils of blackness that groped at the edge of his vision remained, and the voices refused to leave. They will all betray you, Darigan, just like Kass did. Do you think you have your friend back? Do you think it will last long? Not knowing when it had happened, Darigan found himself meeting Revenge’s horrible stare again, and fought down a wave of terror. His silent protests that these monsters had no hold on him sounded frail in the ears of his mind, and he struggled to cling to what he knew was true. “Is that what you think?” an angry voice snapped, halting the Gelert in mid-sentence and shattering the spell of his voice and gaze into invisible, impotent shards; and four pairs of eyes turned toward a small but seething Kougra whose eyes blazed with fury and whose tiny body radiated almost tangible waves of wrath. Tenultra, racing through the halls in her haste to return and defend the prisoners, had come up behind The Three just in time to catch enough of the conversation to set her blood boiling. Tenultra’s hackles rose. “I’ve already heard your opinions,” she spat, then gave an angry lash of her tail. “Do you honestly believe I would risk my life for the sake of someone who’s worth nothing?! No! Lord Darigan is my friend, and if you see and hear as much as you think you do, then you really ought to know...” Tenultra’s eyes narrowed and her claws crackled with energy. “Nobody messes with my friends.” Even as Tenultra’s consciousness focused on The Three, a small part of her mind darted off to the side. Lord Darigan. What is he doing here? He’s supposed to be looking after Kass. Surely he didn’t... is he here looking for me? 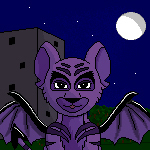 Darigan stiffened. He and Tenultra had spoken of many things, but this was not one of them. He gave the kitten a tense, questioning look, but Tenultra’s attention was fixed on The Three. “I already do,” Tenultra said quietly, her voice barely more than a whisper; but even Darigan wasn’t entirely sure that she was convinced of her own words. Faintly, almost imperceptibly, Tenultra’s breath began to shake, and the sound lit a fire in Darigan’s heart. How often, he wondered, had she been subjected to this kind of onslaught? How often had she been forced to endure it alone? Far too often. That much was only too obvious. And every fibre of Darigan’s being was appalled by the idea that a child should have to stand defenseless under a bombardment of such low and cruel shots. He couldn’t let it go unchallenged. “People say,” he began quietly, “that Tenultra is a monster, a heartless killing machine.” Tenultra’s head snapped up and around, and she stared at him, visibly stunned. Whether this was because she had forgotten he was there, or because she thought he was agreeing with the classification he had just uttered, it was difficult to say. Tenultra was once again stunned; but this time it was different. The lights in her eyes had come back on. “Nobody stays out in the cold for a person who’s nothing more than a murderer, either,” she answered softly, perhaps half to herself. “A pair of fuzzy slippers waiting to happen? I still say that trumps a lame Spardel,” Tenultra responded, a smile appearing on her face as she began to pick up steam. Needless to say, Darigan was thoroughly enjoying this. Never before had he seen or heard of anyone making such a complete and total mockery of three beings who had brought entire nations down. And yet Tenultra had managed it with remarkable poise and deftness- not that a fuzzy blur on the end of Revenge’s tail looked particularly poised or deft. But for once, the traumatized Kougra did look like she was having an awful lot of fun. “ACK! Revenge! Stop waving that thing around!” Ambition yelped, twisting out of the way just in time to avoid the flying Kougra. Greed was not so lucky, and just for good measure Tenultra morphed into a Yurble before she collided with him. Greed cried out and Ambition hissed a curse, then both of them decided to leave before they were humiliated further. Revenge continued to spin a few seconds longer before realizing he was alone, and as he faded out of existence Tenultra suddenly found herself reeling down the hall. Resuming her natural appearance as she flew, Tenultra flapped her wings wildly until she had regained her balance, then turned swiftly and glided back to land at Darigan’s feet. “Are you all right?” she asked, her eyes and voice filled with concern as she stood swaying dizzily. “Did you really need it hanging over your head that you were living in close proximity to a cybernetic shapeshifter who was waging a constant mental war with three of your worst enemies?” Tenultra asked him soberly, and Darigan gave her a strange look. Tenultra opened her mouth, held it that way for a moment as she pondered, then closed it. “I’m not used to asking for help,” she said simply and quietly. Surely she didn’t- then again, why would I put it past her? Darigan chuckled; then a question from Tenultra sobered him. That cheating old Skeith is at it again!